Edited by Charles Geisler and Gail Daneker (Island Press, 2000) Property and Values offers a fresh look at property rights issues, bringing together scholars, attorneys, government officials, community development practitioners, and environmental advocates to consider new and more socially equitable forms of ownership. This unusual book evolved from a conference organized by the Equity Trust, Inc., in cooperation with the American Bar Association’s Commission on Homelessness and Poverty. The book synthesizes much innovative thinking on ownership in land and housing, and signals how that thinking might be used across America. Geisler (rural sociology, Cornell U.) and Daneker (formerly of The Campaign for Peace and Democracy, and Environmentalists for Full Employment) present 13 contributions that call for balance between property rights and responsibilities, exploring new concepts of private and public land ownership that they hope can be applied towards more socially equitable relations in the US. Document how alternative forms of ownership have been used to achieve both social and environmental goals. 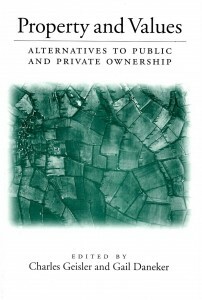 The articles are organized into four sections which explain ownership as a socially evolving concept, challenge conventional public-private ownership categories, survey recent studies on the impact of public policy on property values, and offer examples from other cultures of different ownership realities.